Recovered from the 1673 storehouse destruction level. May have belonged to John Rayner, sea captain and agent in Newfoundland for Cecil Calvert (2nd Lord Baltimore) 1661-62. 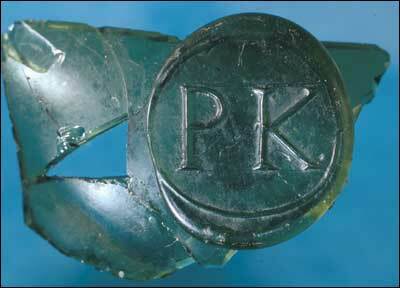 Three seals likely belonging to Phillip Kirke I, third son of Sir David and Sara Kirke. Phillip was a planter, merchant, and boatkeeper at Ferryland. He operated five boats at Ferryland in 1675. He died as a prisoner of war at Placentia in 1696-97. 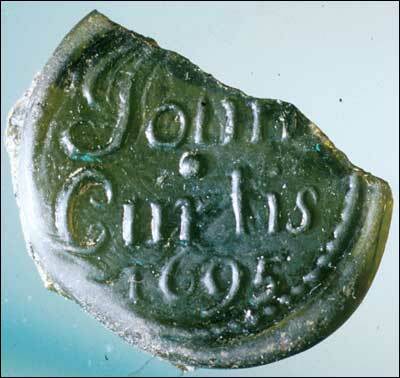 Possibly the seal of John Curtis who was a planter operating out of Port Bonavista as early as 1675. Curtis owned one boat and employed two men. The owner of this seal has not been identified. 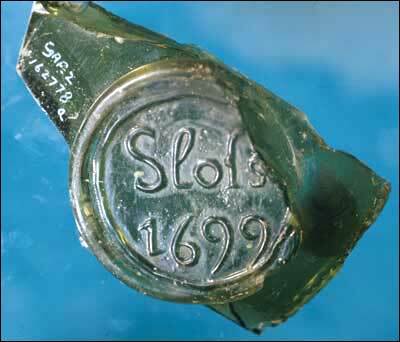 Bottle Seal Wm. Smith 172? 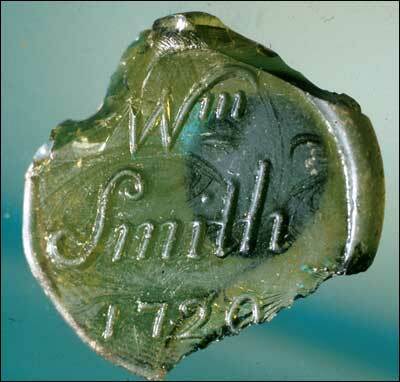 Possibly the seal of William Smith who was a successful planter operating out of Trinity. Smith owned 3 boats and employed 27 servants. He died in 1754? Bottle Seal Tho Holdsw in Da?? 17?? 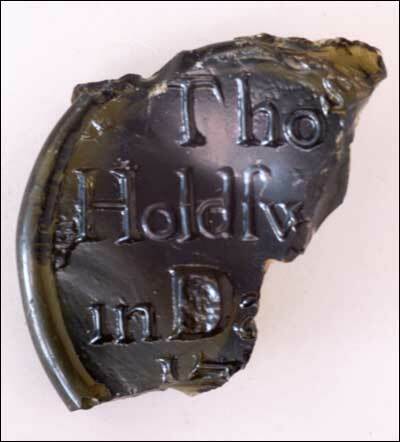 This is the seal of Thomas Holdsworth of Dartmouth. The Holdsworths were adventurers in the Newfoundland fishery (Ruggles Brise 1949:20, 113). 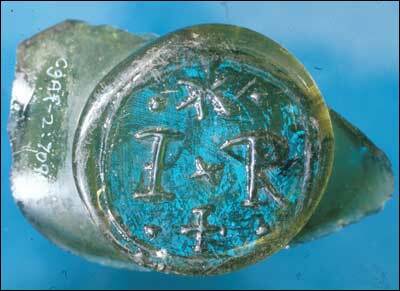 This seal was recovered form the destruction layer of a possible house. 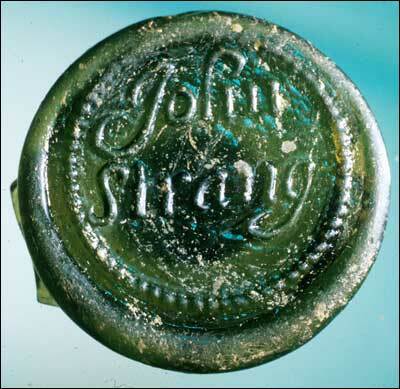 It is probably the seal of John Strang, merchant of Bideford and Barnstaple and commander of a number of ships resorting to Ferryland. He petitioned the Board of Trade in 1707 for protection of the fishery at Ferryland. Excavated north of the seawall, the area consists of a layer of sand, gravel and rock that was dredged from the pool in 1961. 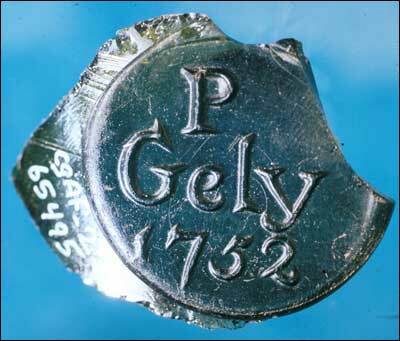 The seal belongs to Philip Gely, a resident of Lympstone, Devon, England who was born in 1720-21. Philip conducted a survey of Bengers Plantation in Ferryland in 1754. 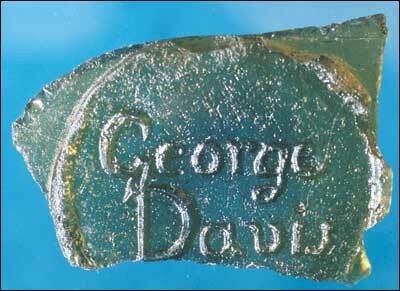 George Davis was a merchant of Topsham, Devon, Poole, Dorset, London and Carbonear, Newfoundland. He was baptized on March 11, 1724-25 and died in Newfoundland (possibly Carbonear) in 1789. He began his career as an agent for merchants Pike and Green in Carbonear in 1757, but shortly after he became a merchant himself. By the late 1770s, Davis experienced financial difficulties and owed a large quantity of money to his creditors.